Radical! The bodacious 80’s Cube Clock will surely bring back fond memories of DeLoreans, Gremlins, and Strawberry Shortcake. 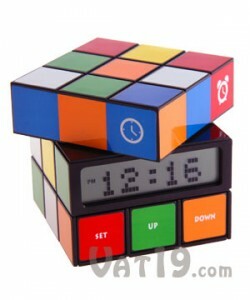 Styled after the mind-boggling Rubik’s Cube, this clock changes modes when you rotate the top. The Cube Clock features the following modes: clock, alarm, calendar (displays date as well as the day of the week), and temperature (Celsius and Fahrenheit). Totally righteous!